As I have discussed at length over the last few months, the Euro currency is in trouble, and the member nations who make up the Euro are all facing potential credit rating downgrades. Drudge is linking the CNBC report that France has been downgraded by S&P, while others are sure to follow in the short run. At present, Germany and the Netherlands aren’t among those under immediate threat of downgrade, but the effects have been immediate as stocks have slumped throughout the morning on fears over the blow-back in financial markets. This is going to continue to threaten the global economy, and it’s becoming increasingly difficult to see a way out of this mess. Meanwhile, there is no deal yet on Greek debt, which is a part of the trouble: Sovereign debt is destroying Europe, and as this occurs, we’re mimicking the levels of expenditure that got Europe into all of this trouble. It’s now clear that during a single term, Barack Obama will have added $6.2 Trillion to the national debt. That’s an extraordinarily dangerous growth in public debt that threatens the economic future and the political stability of the nation. Ladies and gentlemen, this level of borrowing and expenditure cannot be sustained, and I cannot imagine how somebody like Mitt Romney will do anything to change this. He’s a timid politician in most respects, and he has no record of making cuts in issues where there is substantial political difficulty. In fact, the truth is that he’s added to the future liabilities of the state of Massachusetts through his health-care program, that is even now bankrupting that state. In this respect, Romney offers nothing substantially different from what another term of Obama promises to provide: American decline. It’s time to look closely at all of these candidates to see if any have a record of real cuts, because our nation’s future will depend on it. Update: Before I could even get this posted, the situation is fluid, and it is being reported that five nations have been downgraded, including Italy, Spain, and Portugal by two notches each, while France and Austria were each dropped a single notch. We’re well past the end of the efficacy of such charades as the one the Federal Reserve is now undertaking. 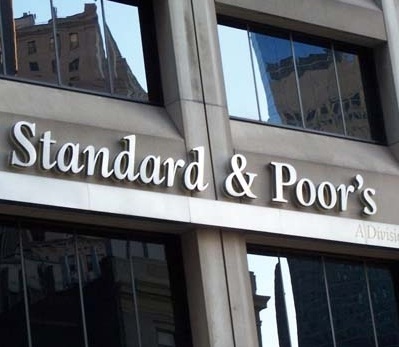 With Europe’s currency on the verge of collapse, Standard and Poor’s has put 15 European nations on negative credit-watch. Worst of all, the Federal Reserve sees the threat to financial stability, and rather than moving to protect the American people, our own monetary agent is instead moving to shore up the Euro via the International Monetary Fund (IMF). Every American should be incensed by this move, because what it really offers is an international version of “too big to fail.” The US has become so entrenched in the future prospects of the Euro currency that the Federal Reserve now believes bailing it out may be the only way to save ourselves. If this sounds vaguely familiar, it should, because this is the same basis by which the American people were suckered into backing up and bailing-out those banks deemed “too big to fail” back in 2008 and 2009, under Presidents Bush and Obama, respectively. Readers may remember a few weeks ago that I reported the swindle being permitted by Treasury, where Euro-based derivatives were now to be backed by the FDIC. That risky scheme actually puts American tax-payers on the hook for hundreds of billions of dollars. Our Federal Reserve has already lent more than $7Trillion to foreign banks, and now it seems they’re intent upon providing still more. It’s an obscenity that at this late date, we’re still pursuing a failed policy that puts bad money after worse money. Why? Simply put, we are so thoroughly invested in the Euro experiment that if we simply walk away, it will fall, and likely take us with it. The problem is, as I’ve previously explained, that one cannot save the Euro by this method. There is only one way in which the Euro might be saved, but it will require something the European people likely will riot to oppose: Vastly more effective fiscal control. To approach this problem will require that which governments virtually never do: Restrain spending, while giving up some controls over the economies of their respective nations. It will require that they cut social spending, but also government employment dramatically. That’s where the real problem begins, because people now long-accustomed to a vast and prolific welfare state do not give them up without a fight. Of course, give them up they will, one way or another, when their system ultimately collapses. We’re not much behind Europe in that development, and our own credit-rating downgrade earlier this year was simply the beginning. We face the same choices, although still less severe. 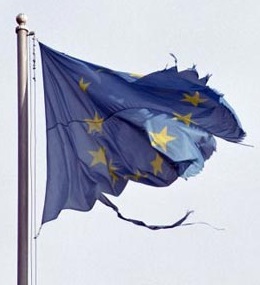 Unfortunately, by entangling us with the Europeans, what the Federal Reserve and all of those banks deemed “too big to fail” that have been major players in the Euro-zone, what this means is that it will accelerate our own collapse. We may even go down, not following behind Europe, but holding hands and walking side-by-side with them over the precipice. It’s anybody’s guess how long this can be extended. It’s possible we might not make the end of the year, or the end of two years before this collapses, but with the direction in which we’ve been heading, collapse seems to be inevitable. The one and only saving grace America may have, as distinct from Europe, is a healthy sense of charity by comparison. Americans remain, even in our current economic distress, the most giving of people. If we are finally forced to confront out own welfare state, there may be some hope that the nation will find some way at least to feed its people, but for Europe, I have no such hope.